This Hokkien restaurant has been around for more than 30 years and one of the famous dish that appears on every single table is the Popiah. 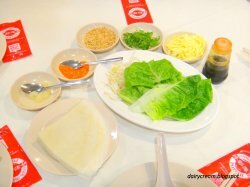 What could be more fun that making our own popiah from the piping hot claypot that is served within five minutes after the table is laid with all the other ingredients. Optional condiments like the sweet Chinese sausages can be ordered starting at $4 for a small plate. Priced at $18 for 6 skins, the pot provides more than enough fillings unless you stuffed each of the skin to its maximum. We had no problem finishing this pot just by itself because the julienned bang kwang topped with mini dried prawns were juicy and fragrant. The popiah skin is resilient enough to withstand the excess moisture, though we encountered several failed attempts to transport our masterpieces into our mouth without breaking the skin. 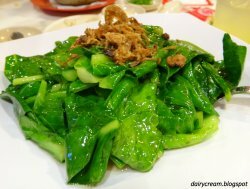 The stir-fried baby kalian ($10) that boasts a vibrant fresh shade of green, are crunchy yet permeated with the breath of wok hei. 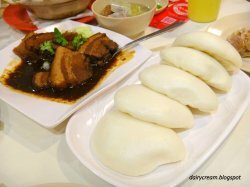 The stewed pork is yet another rich and delicious braised dish that comes with the standard white buns ($16). The bonus slices of yam escaped the humdrum of a typical stew pork bun that is stuffed only with lettuce leaf. 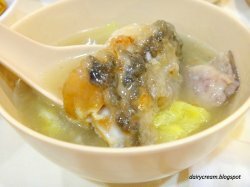 The Fish Head and Yam soup ($16 for small) did not look inviting but received praises from the tables for its wholesome flavours. The slurry broth is furnished with subtle sweetness from the napa cabbage and yam. And the deep-fried slices of fish were meaty and delivered comforting aroma that would be impossible if they had not brush encounter with bubbling oil. 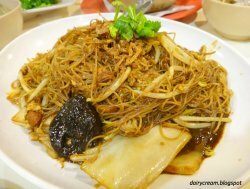 But the star of the night is none other than the Pig Trotters Bee Hoon ($14 for small). One can relish in the homemade goodness of this dish that is moist but not too wet. Napa cabbage, mushrooms, bean sprouts, bits of eggs and crunchy shrimps bolster the flavours of this dish. Everyone was obsessed with this dish despite being stuffed to the brim with the earlier dishes. 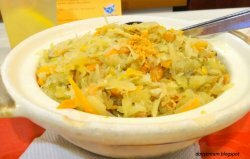 This is a reliable restaurant that you can count on for some wonderful heritage dishes. Just remember to place a reservation in advance especially during weekends if you do not wish to join in the queue.